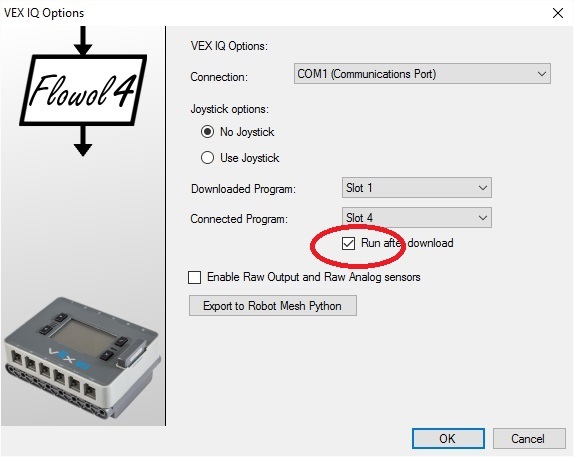 In this example, please connect your claw bot’s wheel motors to port 1 and port 2 of the VEX-IQ robot brain. Select ‘check mark’ for ‘run after download’ – normally you should unchecked it, but for this example program check it. Click on port 1 and change it to motor 1, and do the same for port 2. Drag and drop a ‘Start/Stop’ symbol from the left column to anywhere in the center programming area. Click on the symbol to designate it as ‘Start’. Drag and drop a ‘Output’ symbol from the left column to below the start symbol in the center programming area. Click on the symbol to designate it ‘Start’. Drag and drop a ‘Delay’ symbol from the left column to below the output symbol in the center programming area. Click on the symbol and set the value to 5. Drag and drop a ‘Start/Stop’ symbol from the left column to anywhere in the center programming area. Click on the symbol to designate it as ‘Stop’. Click on the arrow symbol from the left column and link all the boxes together to create a complete instruction set. To test this program on-screen (with out the robot) – click on the red ‘play’ icon on the lower hand corner. Make sure to save this program before downloading it to the robot. Check to make sure the USB cable is connected and that you have selected the VEX-COMM port at the Interface Menu. The file name will be displayed on the robot brian’s screen upon successful download. 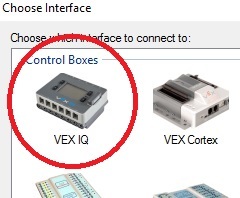 Click to Connect – allows you to operate the IQ robot by simply clicking the various ports on the screen. 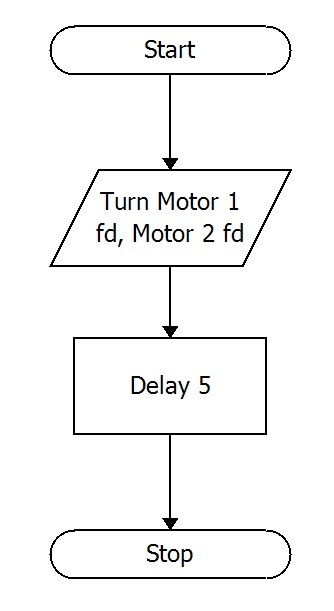 Warning – this test program will switch on motor 1 and 2 and will most likely spin your robot rather than going straight. Q) What should you do next to correct the problem?